You must make reservations at least 5 minutes in advance of the time at La Fontana Della Citta. Closest parking lot is on 17th and Pine, just a block away. There are also multiple parking lots around the restaurant that you can use to park. Business meeting, Birthdays, Weddings & Rehearsal Dinners. Please call for details. Jersey Shore pilgrims might be familiar with La Fontana Del Mare ("The Fountain of the Sea"), the award-winning restaurant in Strathmere. Owner Rafael Kupa is excited to bring his most popular dishes to Philly at this new "Fountain of the City," a 100-seat BYOB right off Rittenhouse Square. Don’t bother to order the Caesar salad. They obviously use packaged dressing. Clearly not homemade. The lettuce was fresh so it was palatable but I could make the same Caesar at home with a bottle of Wishbone. The bread had no taste and was hard but maybe not stale. We ate it but I like fresh soft bread with deep flavor much better. The main thing that ticked us off was the staff’s ambivalence with regards to a very noisy table of 10. The young twenty something girls were screaming like banshees and this continued for 2 hours. The staff told us excuses like the girl was drunk and they give more leeway on Saturday nights and that that they spoke to them three times and there “was nothing we could do.” Then when my wife approached the table to see if she could get them to calm down, the manager came to our table and told us not to go to his customers and curse at them in his restaurant. She did not utter a curse or even yell. The kids very rude to her. At that point we just said bring us the check and when the bill came, they didn’t even give a complimentary cup of coffee— nothing. They treated us worse then the rowdy table. We decided for the first time in my life to not leave a tip because we were treated poorly. No apology, nothing. I feel bad for the waiter who was very good, but the manager was at fault and should compensate the waiter because it is the manager’s actions and training by example that resulted in the lost tip. Food was excellent. Just the right portions. We ate out side which is why I gave it 3 stars (not much of a scenic view) We love the BYOB aspect. We will being going again for sure!! Food was SO GOOD! The service was great and very accommodating. My only complaint is that the portion sizes are small for the price. I was still hungry with I left but I couldn’t justify ordering another plate of gnocchi. The pasta is homemade and tastes great. We will visit again when in Philly center city. Dishes were great other than the antipasto which could have been made better from premade grocery ingredients. Our server was very attentive and he didn’t rush us. The food was very good. Lovely food. Friendly wait staff. It was our first time there and everyone in our group enjoyed it thoroughly. We will be back! The service was very slow. The restaurant was empty and we still waited a long time for our server, who returned smelling of cigarettes. The food was not good. It lacked flavor. The bruschetta was the worst I’ve ever had. The tomato sauce on the shrimp pasta was terrible. We had heard that this restaurant was not good but thought “how bad could it be?” The answer is terrible. Probably the worst restaurant I’ve eaten at in Philadelphia. Food is good; not great. Waiter was not particularly friendly. We were glad the restaurant good accommodate a large group at the last minute. Fantastic BYO. Service is friendly and helpful. Great for a nice dinner before going to a show at the Academy of Music. The food was incredibly good. I asked for a vegan pasta and they made a delicious one! I wish they had more vegetarian/vegan options without having to ask for special things to be made. They did a great job with my meal and they should put more of that on their reg. menu. Nice ambiance, will definitely go back. Fairly loud dinning room Portions oddly composed, lot of chicken accompanied by 2 slices of potato and 2 pieces of broccoli. BYOB that charges a corkage fee. Salads very expensive. We notified the restaurant we were celebrating a birthday, was never acknowledged. They would not honor a gift card from La Fontana in Avalon despite the fact when they sell these cards they tell you they can be used in all locations. Affordable, family-owned old school Italian-American restaurant. Portion sizes were even larger than I expected. The waitress was very knowledgable about the specials and dessert options. And of course, I can't turn down a good BYOB opportunity. Pleasant wait staff but a little slow to refill waters and drinks and a little too much gravy in my dish which I heard from a few others. This was a top notch dining experience. Highly recommended. Absolutely love this place - hands down best Italian in Philly (must try the gnocchi sorrentina!!). I go there every time I have visitors in town! Great service, wonderful staff, and delicious food!! This BYOB is always my go to place for a great meal and friendly service! Everything was very good. The only issue I had was the noise level. It was difficult speaking to someone at my table across from me. But it was extremely busy and it was a Saturday night. Otherwise, the service and the food was superb! Our server Elvis was wonderful and the food was delicious! Our son’s engagement night. Dinner for 9 and everyone raved about the food. It is BYOB so bring your favorite and enjoy great food in a beautiful room. Pricing is very reasonable too. Restraunt week- Reservation was at 9:15 didnt sit till about 10:15. Poor reservation skills due to a frat party taking up the entire restaurant. Otherwise staff was attentive and food was amazing! The restaurant was grossly over booked with large parties everywhere and clearly not enough food or dining ware to comfortably serve their guests. They booked an entire fraternity that was very loud along with three birthday parties while we were there for restaurant week. They ran out of bread and tiramisu. If you’re going to participate in restaurant week, I recommend that you have enough space and man power to serve your guest s comfortably. The food was also sub par. Overall, it was a very poor experience in comparison to all other restaurant experiences that I have had in Philadelphia. A great get together! Food was delicious! Very friendly and warming staff! Service was very rushed and unappreciated. We only get together twice a year. We would have enjoyed ourselves more if we were relaxed throughout dinner. Good neighborhood place for Italian food with friends! Attentive staff, authentic Italian cuisine, great for lunch or dinner. 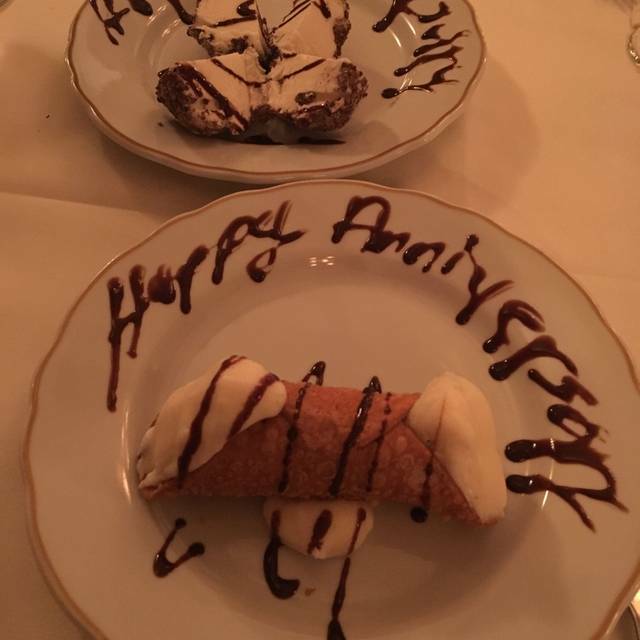 My girlfriends and I went to La Fontana Della Citta for Philadelphia's Restaurant Week and it did not disappoint! The food was really good, but the staff made the place. Our waiter was from Italy and could answer all of our questions about Italian cusine, things that are not even on the menu. He was also really funny. It's great too because its BYOB with no corkage fee. The food was hot and delicious. Service was excellent. I wish they served better bread.